I haven't been blogging much lately. I started off hoping to help the industry change for the better, but looking back at my past posts, I'm safe to say that nothing has changed. If anything it has been one small step forward, one big step back. When it comes to whether I blog or not, I'll quote Hillary Clinton: "what difference does it make?" This type of commercial would not work for horse racing. Horse racing has to focus on "the thrill" (entertainment) only. The problem is that horse racing is about 10% pure entertainment, 90% gambling, and the thrill when it comes to gambling is a) winning b) the ability to keep gambling. Two thing important to all gamblers, the ability to possibly be a long term winner, or at least, the ability to keep gambling without going to the well too frequently. Slots proves that the more you cash without going to the well too much, the more you will tend to come back and play again at a later date, despite losing almost every time you go. It works just as well for roulette and blackjack. 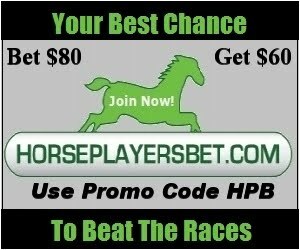 The more money tracks take out of the collective Horseplayers hands each and every race, the less fun they will have, plain and simple, and the less likely they will go home, or get up the next day (if they are playing from home), believing the game is beatable. Has the industry ever toyed with the idea of optimum takeout? 5 letters: NEVER. The concept doesn't seem to exist, thanks to the pie-shrinkers who rule the industry. Most of these pie shrinkers don't want to shrink the pie, but short term thinking and the just plain bad priorities make shrinking the pie inevitable. The industry keeps tapping its Ruby Slippers together while closing their eyes, repeating "the game is 100% entertainment and people want to just bet on it." Seriously, how much money from those who may have wagered for the first time on American Pharoah in the Belmont is in the pools today, or yesterday, or will be tomorrow? If horse racing were to have come along after Daily Fantasy Sports, they would enter the market with a takeout of around 8-10% for Win Place and Show, 12% for Exactors and Doubles, and maybe 14-15% for all other exotics tops. Who knows, in a parallel universe or two or three, maybe that is what is happening right now, but not here on planet Earth. Super trainers exist. There are only so many ways to train a horse, yet some trainers, even when they have strings at multiple tracks which means it can't possibly be due to superior horsemanship, especially if this special horse whisperer isn't even around, yet they win consistently at around 18% or more using their "special" routine. It is an insult to anyone's intelligence that these outfits aren't using chemicals or supplements that aren't being tested for. I also hate the excuse that 99% of drug tests come back negative. Pretty simple stuff, they are testing for a limited amount of substances, and there are ways to mask certain substances too. that a horse has turned the corner, or just had a shock wave treatment or just came out of a hyperbaric oxygen chamber, you may be able to get your ROI to .94 level (which, although won't make you money, it does take away some money and some potential future run ("gambling fix" money) from anyone who has a lower ROI). Newbies will come and learn the game once there are visible winners. The game could be hay and oats with a 360 hour barn surveillance, and it wouldn't create an extra player, except perhaps through friends of smaller owners who might be in the game a bit more thanks to a higher ROI (because the ROI of drug trainers' outfits will decrease). With B and C racetracks racing less now, even that portal to growth is shutting down and may not swing to positive territory even if there was an equal playing field. Whipping rules, which I'm all for, don't change handle totals at all. The fact that fixing the drug problem may be irrelevant to handle, it still should be attempted. Lasix or no Lasix? I've read and heard many pro and con arguments out there. I'm still learning. For example, by watching the NYRA conference on Youtube, one trainer mentioned that in the old days, they used to prevent bleeding by not allowing the horse to eat or drink 24 hours before the race (I've since heard that some trainers used up to a 72 hour time frame). And of course, the pro-Lasix people state this was more inhumane than using Lasix today, but when it comes to my Columbo instincts, I still have to ask, why did horses used to run twice as much in the 60's or 70's than today, and was it a more cruel backstretch back then? Is it Lasix or a combination of Lasix and all the other chemicals that are pumped into today's horses (It isn't a far cry to believe that the best trainers today are superior junior chemists or have a great junior chemist vet going for them)? Does it affect recovery time that much? Are horses weaker today than they were back then because of breeding horses prone to bleed or the use of well bred sires who retired early due to injury? Does the need to breed speedy 2 year olds to get quicker returns for the buyers the cause? You know, it is probably a combination of lots of things, but it wouldn't shock me that if Lasix was banned horses would be racing more often, fields would be fuller (maybe 5% would have to be retired, but the other 95% would be able to race 50% more times, maybe even greater than that). With high takeouts, the use of non-detectable designer drugs, the slaps on the wrists given to cheaters who are caught, the use of shock therapy, and so on, the industry has proved it can't price itself and it can't regulate itself either. Something should be done. I use the word "should" be done versus "must" be done, because as we've seen, nothing might be done, and the industry can keep floating in a near purgatory state. From a bettors standpoint, and I've stated this before: In a perfect world, there would be around 5-10 drugs and supplements (I don't think Cobalt should be on the OK list, for example) combined that can be legally administered. Anything else would be forbidden, and cheaters, when caught would be faced with a minimum 1 year suspension first offense, 3 year suspension second offense, and lifetime ban for a third offense. Vets would be just as liable. As for any surgeries, shockwave treatments, hyberbaric treatments, and tappings, the public should know. How come we know if an NFL player stubs his toe on Tuesday night while getting out of bed to check on his baby, but Horseplayers are in the dark when comes to an outfit shelling out some good money to tap a joint? And finally, I still find it perplexing that one can legally bet on Fantasy Sports online in almost every US State, yet the list of States where potential gamblers are shut out altogether from betting the ponies is much greater, and this includes the "free" State of Texas. Racing does not have its act together to even make an attempt to grow their customer base that way.